Race Recap: Epic Series Season Finale – Hardest Challenge of the Year. 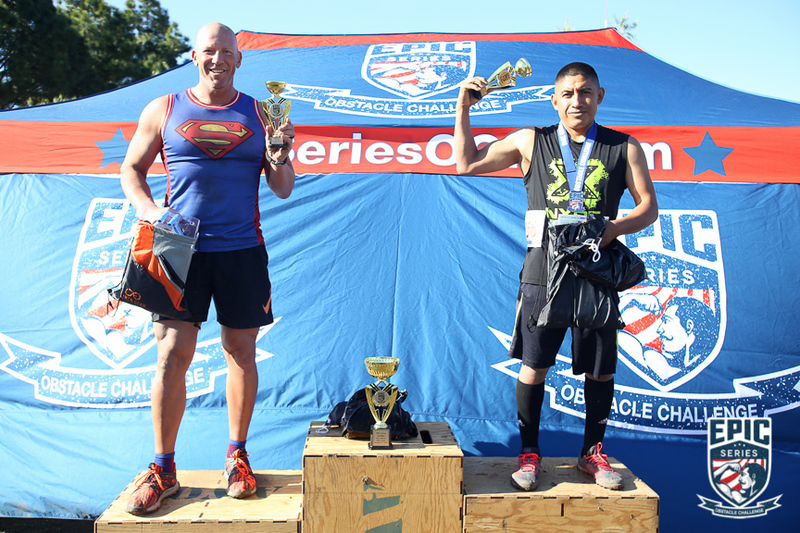 The Epic Series OCR challenge on December 17th was the final race of the year in San Diego. This would be my 3rd time this year competing in one of their events. This event was going to be the hardest one to date. For me, a master’s level competitor at 45yrs of age Epic series in 2016 has continued to offer an elite wave for anyone 40+ years of age for their open course challenge. This year I have had some success by reaching the podium three times on the two previous races. Personally, I wanted to enter this last competition of the year trying to claim my trifecta by getting another 1st place master’s victory on the open course. As Epic Series has continued its growth so has the elite master’s enrollments, and this race was seeing the most they ever had. 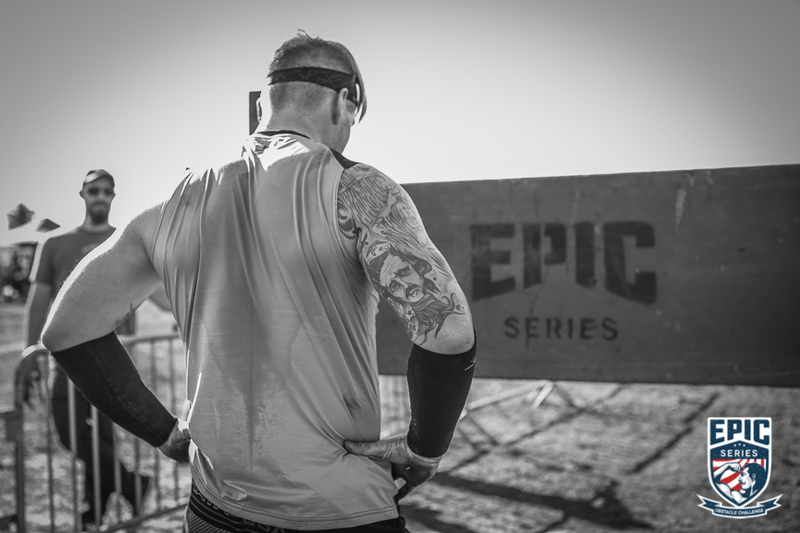 Epic Series offers two courses for the price of one if you are an elite competitor. The open course and the strongman/CrossFit course as I call it. You have a choice on the second course on how you want to test your speed, strength, and skills. The “endurance” option challenges you with lower weight, more reps and the “strength” option challenges you on heavier weight, fewer reps. For me on all previous races I had chosen the endurance option for the protection of a lower back injury that I’ve had since 2009. On this event, I decided to go for the strength course partly because of a new design the had for us on the elite course. At this location, they were not able to use barbells as they have in the past. In place of those, they decided on a more “strong man” type of challenges. After choosing the strength course and finalizing my registration, I felt a bit nervous and excited for the challenges that I would be facing. With registration behind me, I now had 6-weeks of hard, intense strength and endurance training ahead of me. My focus switched from trail running to being in the gym 4-5 days per week with one day of group Tabata training with Phoenix Evolution for my endurance and cardio training that I would need for the open levels course. Is this OCR, Crossfit or both? I heard about Epic Series being taken over by new ownership earlier this year and the new direction of them trying to standardize their races at each location. This has been true at both events this year. 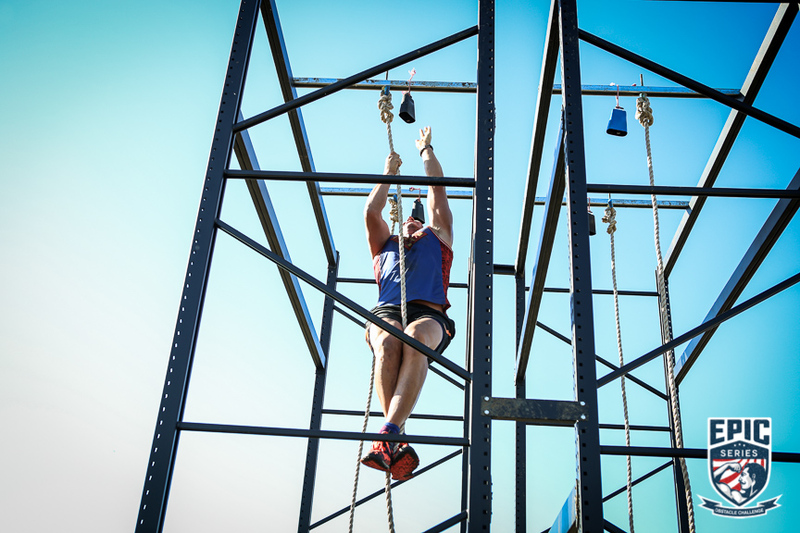 As I mentioned earlier, they continued offering an endurance and strength option for the elite challenge course. Endurance boosts lighter weight with more reps, while the strength is heavier weight with fewer reps. 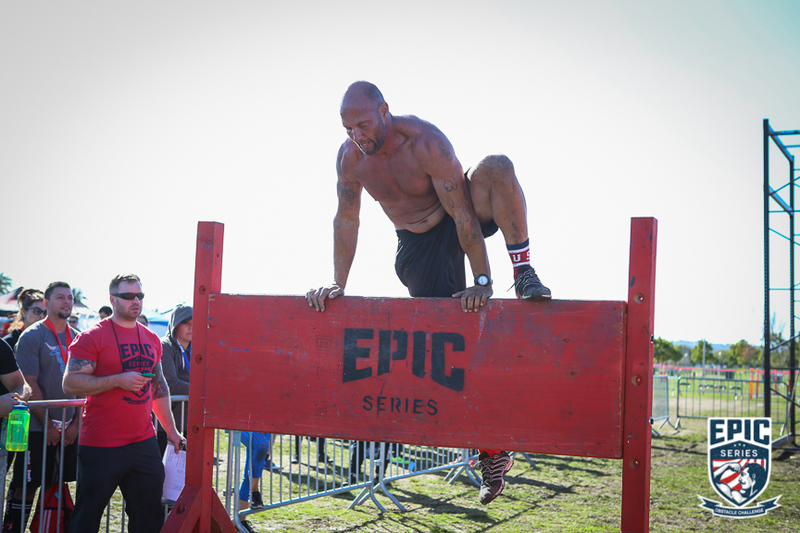 The Epic Course is usually about the size of a football field with 25+ obstacles strategically placed into the middle allowing the outside of the course for the running/carrying objects parts of the race. This section of the race has an OCR feel to it with many familiar obstacles. You will also find many functional fitness type challenges that will also test your skills, endurance, and strength. 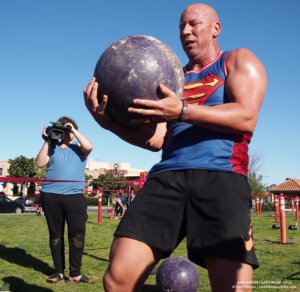 Now If you are one of the athletes that chose to compete in the second elite course then after you catch your breath for a bit you get to take on what I call the CrossFit/strongman segment of the race. After competing in 4 Epic races in the past two years, I can honestly say that when I’m on the elite course, there is a CrossFit feel to this part of the course. Next, I wanted to get a peek at the course and what some of the obstacles and challenges that we had to face. What I like from the last two events is how they have been standardizing their design and how everything looks and feels. On this event, they faced a few challenges in setting up from the rain that was happening they day before. As I did a quick run around the outside of the course for my warm-up, I could tell a few obstacles were not quite ready. If you're not familiar with what the course offers here is a quote about what the Epic course is described as. As I was getting ready for the race, attaching my bib and timing chip I heard a very familiar voice off in the distance making a few announcements. Epic Series hired independent race consultant Anthony T.C. Carson for announcing the race. I was super excited as I have not seen him in a long time and he knows how to fire the racers up! After saying hello I focused my attention on getting warmed up for my start time. In the distance, I heard my wave called, so I made my way over to the starting line, grabbed my signature Epic Series flag that you run with for the first lap before entering the course of obstacles. First up after dropping my flag was the 60lb atlas stone toss over the shoulder for 15 reps. Before moving onto the Keg barrel hoist. 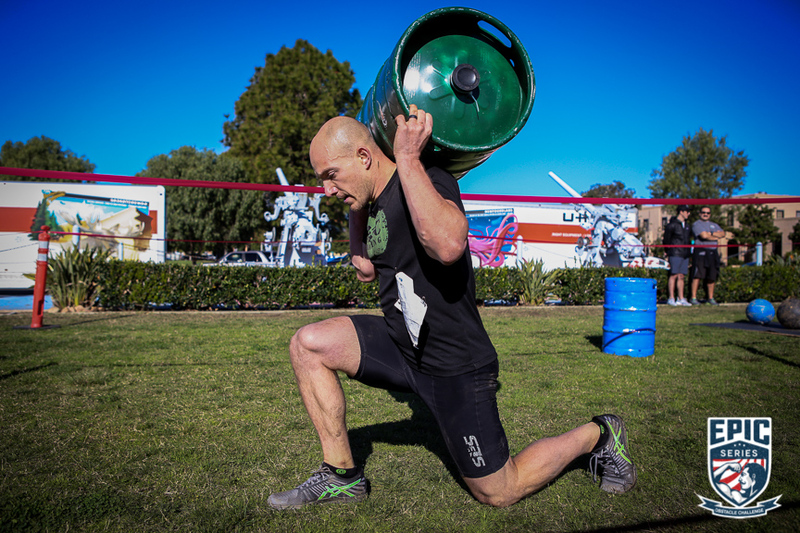 This is another relatively easy obstacle that requires a little strength, but mostly speed. Next were a series of walls with varying height and difficulty. I was keeping pace with an unyielding and fast competitor in my wave that I went against last time. I was slightly ahead of him going into the “Lumberjacks” obstacle. Another obstacle that challenges your strength and endurance. As you move on you, find yourself at the “Russian Twists” obstacle where you must complete 50 reps with a 25lb weighted ball. At this point is where I gave up my lead by about 30 secs. After busting those out, they had you climb over an inverted wall making your way to the short 15 ft rope climb where you had to complete two climbs ringing the bell. I slid down the rope as fast as possible, so I could get to the next challenge that requires you to hold a plank for 3 minutes! Yep, 3 minutes of planking with no chance of breezing through that obstacle. The guy I was keeping pace started to extend his lead to me with only a small hope of me catching him on a few of the heavy carries where I could run and gain some ground. Ahead of me, I had more walls, a low crawl, then onto the 30” box jumps with burpees. We had to knock out 15 of these before moving on. I was a bit gassed on these after about 9-10 and had to rest a bit for the last 5. Next up we put this stretchy band around our ankles and walked about 15 yards down and back, then hop, down and back and then a front shuffle. I quickly knocked these out moving onto the “Jerry Can” carry. The water filled jugs seemed a bit lighter than last race, so I quickly ran the entire lap with them. This is where the course got a bit confusing, and I got misdirected by one of the volunteers. I looked up and saw the guy I was chasing at the “Archery” challenge. This is a skill obstacle where you need to hit the target three times before moving on. I managed 3 out of 4 then I sprinted to the last obstacle the “keg barrel” carry. Again I was able to run the entire lap with it on my back and crossed the finish line in 22:40 which I learned later got me 3rd place in the master’s division. So I did not defend my title but completely happy with my performance. There were many more obstacles than what I mentioned. The competition on this day was top-notch more than I had seen in the past. At the finish line, I collected my finisher’s medal and a complimentary t-shirt. 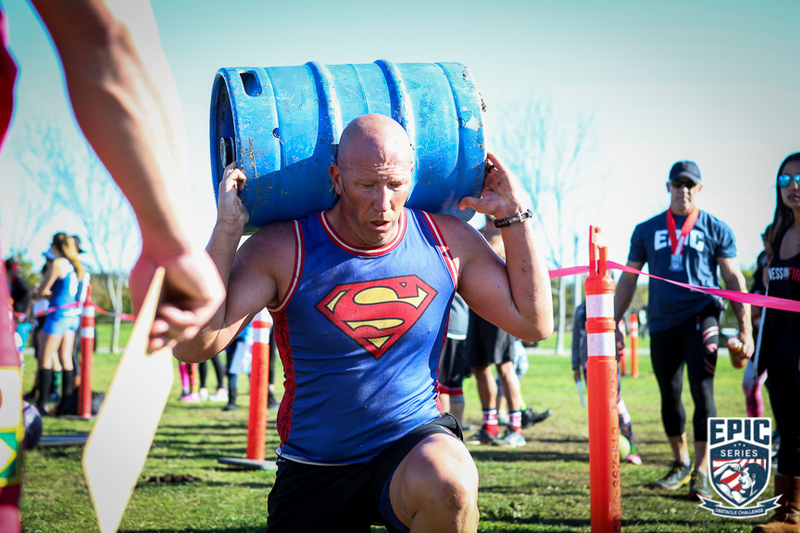 On this event the Elite Course features 10+ strength challenges incorporating handstand walks, sandbag thrusters, farmers carry, kettlebell step ups, keg barrel lunges, atlas stones toss, a tractor pull, a heavy tire flip, and even a 25-foot rope climb. The EPIC Athlete with the fastest combined time between the Epic Course and the Elite Course takes home the EPIC Championship Belt! After resting for around 30 minutes, I heard my name called. I choose a very early time slot that gave me little rest in between each course. As I reflect back, I should've chosen a later time slot giving me a bit more rest and allowing myself to consume some fuel allowing my muscles to recover a bit. It was time to get ready, and I was given 5 minutes before my time would start at the truck pull. In the previous events, the Elite course was laid out in a very open format. Today Epic Series chose to have all obstacles staged in a lane. This was a format that I enjoyed. This format allowed for other athletes, friends and family to be very close to you. Trust me having people right there cheering and pushing you on is extremely helpful and motivating. I hope this format continues at future races. As I approached the truck I had to pull I noticed that Epic Series took my advice and purchased a new harness system for us to use for pulling this heavy truck. The last event it broke and many of us had to use a smaller harness that caused pain. This pull was a small U-haul type truck that needed to be pulled about 25 feet before moving on. You were given 90 seconds to make it that distance, and if you did not complete it, you were then penalized another 90 seconds. Next up was the dreaded “handstand walks!” This was supposed to be only 20 feet (as stated before the race day on their website) that turned out to be around 42 feet when measured. I ask the head official why that distance was changed and what I was told was because of the difficulty of this obstacle they were going to allow (un-broken) movements. This allowed us to do our best and continue from where we fell. I only found out the week before these were added. I was able to do a little training at Phoenix Evolution in Arizona with some of the coaches, and this helped me get through this obstacle. Quickly I covered the distance that was in front of me. The next obstacle I knew was going to be one of the hardest challenges for me personally! 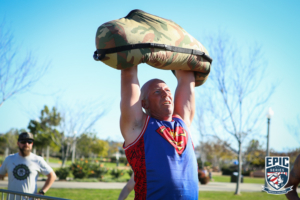 They called it “Sandbag Thrusters” and for the strength athletes that meant 125 lbs that needed carry first for a 10-yard walk then basically a front squat with the big loose bag in front with a quick movement up with a full extension of your arms in a pressing type movement. This obstacle would require a total of 10 reps, five at each spot. I struggled with this front shoulder pressing movement. Knowing in the back of my mind I could not move on until all reps were completed I could tell I was using way more time than I expected. Cheers from fellow athletes and my personal integrity are what kept pushing me to execute all ten reps! This took a lot of me, and I know I was falling behind spending about 4-5 minutes here. Time to move on and makeup time on the next few obstacles. For me, the next one was very easy. The “Farmers Carry” was 2×100 lb cement blocks with handles that needed to be carried about 30 feet down and back. I quickly knocked those out gaining a little bit of time back before moving on. Up next was the “Atlas Stone Shrugs” with three heavy stones that we need to hoist off the ground and toss them over our shoulder. I started with the heaviest one at 160 lbs for one rep. That was a bit harder than I’d expected it to be. Next was the 130 lb stone that needed to be tossed two times. This stone was a bit wet and slippery. I had to get low and hug it to get it off the ground. On the first try, it slipped out of my arms, and I got a bit frustrated. I was fighting the time and the course. I quickly grabbed the stone and knocked out the two that needed to be done. Up last was the 115 lb stone for three reps over the shoulder. Cheers from the crowd and friends helped me at this point. Just some good old fashioned motivation to power these three reps over my shoulder. After expending a ton of strength and energy lifting the stones off the ground, I found myself standing in front of a 100lb keg barrel. I needed to pick this up get it on my shoulders and perform “knee to ground” lunges for 10 yards down and back. These are usually very easy for me, and I was not worried about the lunges, but all of the previous obstacles had taken it’s toll on me. For some reason, I had difficulty with getting the keg barrel from chest height to over my shoulders. Again this is where strength and endurance are needed for a race like this. I took an about a minute break to allow my heart rate to come back down. I focused on my breathing and pictured a different movement to get this over my head and onto my shoulders. After the refocus, I was able to get the barrel onto my shoulders and conducted the required movements and distance. Moving onto the “Kettlebell Step-ups” with each of them weighing 80 lbs for a total of 5 reps onto a 24” box was going to be challenging. The way they had the line-up of challenges in this race was thought out perfectly, and this left your legs shaking after those keg lunges. Luckily I have very strong legs, and I trained with this weight many times before the event. Even though was I tired I managed the five reps without any rest. In the back of my mind, I knew I still needed to make up time from the sandbag thrusters I got stuck on earlier. For that next obstacle, I practiced a lot for the past three weeks before the event. Due to an injury with my back I’ve been very protective with heavy deadlifts and heavy tire flips! Now about this tire that was here at the race today I believe was not close to the 425 lbs they advertised and it felt closer to almost 500lbs. This tire was HUGE! As I moved over to the tire, I felt my heart rate was high, so I decided to just get a feel for the tire with my grip. After an about 30 secs I felt ready and gave this big tire a try, and it barely moved. I looked at my buddy and said this is no 425 lb tire; it's way heavier! 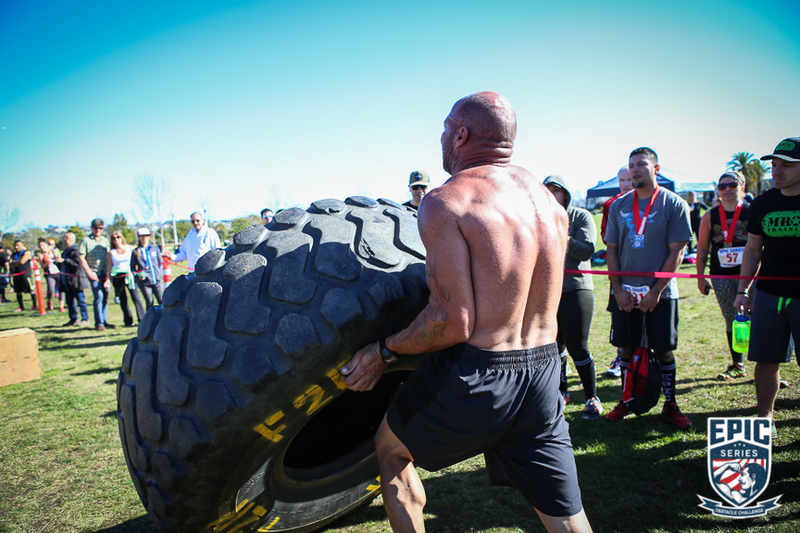 In my training, I could move a 400 lb tire 10-12 times and this one I could hardly move. So I got back under it and lifted with everything I had suddenly it moved to a place I could get underneath it then push it over. So that was 1 of the 5 I needed to do. I asked the judged what my time was and he said around 12 minutes. With that, I still had to finish four more flips, and then two more obstacles before the 15 minute allotted time ran out. My focus and determination kicked in. I was, saying you can do this, you are stronger than you know, keep pushing! Getting into position for the second flip I felt that energy and strength kick in. I did not want to fail. I did not want to be a DNF. So with everything I had, I pushed over reps 2,3,4 kind of quickly. Hearing the crowd and my wife cheering for me gave me that extra effort I needed. Tire flip number 5 done! Time was running out I had to get moving. This next obstacle has always been my best and one of the fastest. Being tall for once paid off with this challenge. Epic Series calls this “Atlas Stone Wall Jump, has” and today in the strength edition have a 130 lb stone to toss over the 6-foot wall, then jump over the wall and repeat that same process five times. I moved very quickly with an intensity that allowed me to lift these stones with an ease I was very surprised! Nearing the 14-minute mark when starting this challenge the entire five reps took me about 40 secs to complete. Time was running out, and I need to get to the final obstacle. I ran over to the final obstacle and caught my breath for about ten secs. The 25-foot rope climb was all that was standing between me and completing the course without any penalties and without failing any of the required reps. I knew this rope climb would be a bit more challenging. Today they choose a very thin and skinny rope. These can be a bit harder to conquer. But today on this day, after all, I accomplished I was NOT going to fail this rope climb. I completed the climbed quickly and rang that bell. Afterward, my judge told me I completed everything with no penalties. What did happen was I ran out of time on the rope climb I passed the 15 minutes maximum course time? With that, I had to be accessed a 90 sec penalty. This penalty cost me a 3rd place finish in the overall category between both courses by just 50 secs. The emotions hit me a bit as it all sank in knowing it was one obstacle that held me up and cost me a podium finish. But knowing I finished 4th overall on the strength course out of 14 very strong competitors had me feeling victorious. Epic Series is a race and competition. 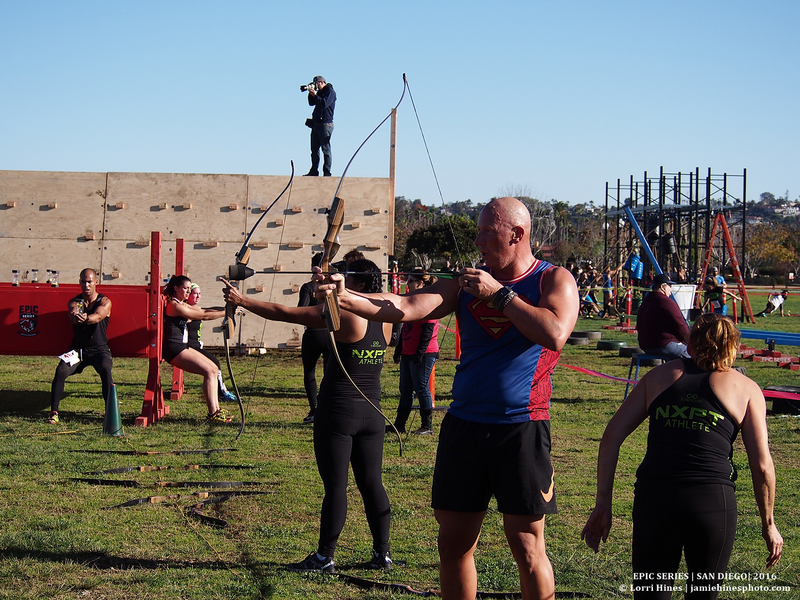 If you are going just to have fun and test your skills and try something new, then this is a great event to challenge yourself and test your abilities. If you're a serious competitive elite athlete that wants showcase your endurance and strength against other top athletes, then you should be finding a race now. In case you are not familiar with Epic Series, I hope this article has given you a bit of insight on how they do things a bit differently than many other OCR races. This leads me into a few comments about their timing, rules, and penalties and how they work. I will say that I don’t have any issues with the timing and how that is done on the Epic Open course. Again I’m commenting on this from the “elite” athlete going for the podium and prizes they offer. Timing has been spot on with all three races I’ve done in 2016 it’s a manual process that is done by an amazing team. The rules on the open course are very easy. 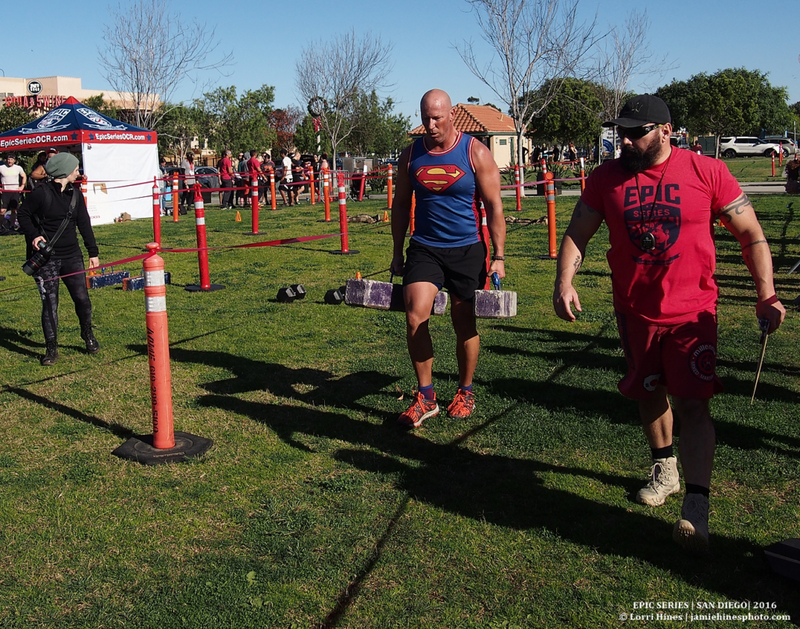 Complete the hardest obstacle at each station or you will be disqualified from winning any prizes. You get to still complete the course. I felt Epic Series has done a very good job in the past about assigning volunteer judges throughout the course. However, on this event, I felt they were short on certain obstacles they needed it. There is no way for one volunteer to carefully watch each elite athlete completing all of the required reps before they move on. This needs to be tightened up a bit as they continue to grow and draw more elite athletes. At each race, I have personally witnessed people missing reps and moving on faster than they should be. It comes down to personal integrity, and that’s all I can say. But this is a competition, and many athletes train very hard before each race. Many of them are attempting to improve their previous results, and it can be frustrating if you witness this first hand. Moving onto the Elite Strength/Endurance course where you have a judge scoring your performance as you attempt each obstacle. The rules and requirements were posted on their website months in advance. New at this race over the two previous events was the scoring and penalty system. This is a snippet from their website that shows what the posted rules are, these are two of what caused some confusion for me, other athletes and even a few of the judges. What I fully understood by the head official was the statement in rule number 6. Where it states that each challenge must be completed with the full amount of reps or distances! But then you jump down to rule 8 and then it says; “any challenges not completed in full will result in a 90-second time penalty. When I did my course I knew in the back of my mind that I “must” complete each station and reps before I could move on. If I did not then I would get a DNF. If I would've known that giving my best effort and attempting the reps was all I needed to do and I would only be accessed a 90-second penalty then I would of not spent 4-5 minutes at one station. Taking the penalty would of helped my time and ranking. I”m not sure if this was a break down in the day off rules versus the published rules. Maybe some of the judges were not fully communicated with about what each athlete was allowed to do. Many of us that have done previous Epic Series races liked how easy the timing and penalty system was before. Again they are a growing company under new ownership in 2016. I personally love what they have created. They have their own niche and athlete following and with each race and word of mouth their numbers continue to grow. I would love to see the rules a bit clearer and easy to understand. Again I talked with the head official from the elite course that day and what he did tell me is that he was the one that looked at every score sheet and ultimately he had the final decision of what the correct penalties should of been even if there was some errors that he could see. I felt a bit of relief hearing that statement. Epic Series what can I say besides a few tweaks they slowly have become a big favorite of mine in the OCR industry. They listen to feedback from many of the familiar athletes. If you have not had the chance to try one of their events you need to get to one in 2017 they already have 4 races lined up with more being added they told me. Plus have you seen their championship belt that is given to the overall winners? They are pretty Epic! I seriously give this event and this race series 4.5 stars. Jamie it was good racing against you can’t wait till future events if nothing else sit back and chat with a fellow masters….thanks for the competition and I cheered you the whole way lol….